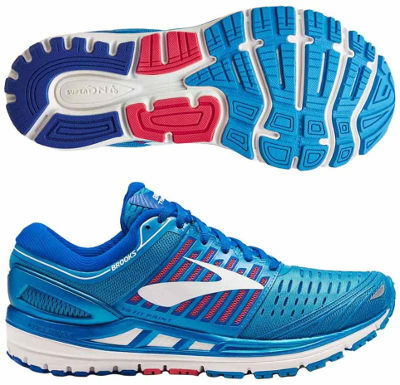 Brooks Transcend 5 are stability cushioned running shoes. The premium Brooks Transcend 5 becomes not only better but also more attractive each edition, a great work against of the most usual complains from pronation control runners. Although there are no radical changes in current fifth edition (even 8 mm drop still the same), latest developments of top technologies have been applied resulting in overall improvement and typical price increase. The Transcend 5 is placed one step above bestseller Adrenaline GTS 18 within Brooks pronation control lineup, in direct competition with powerful Asics Gel Kayano 24. Upper is now much cleaner and more stylish compared with its predecessor Transcend 4 with knit mesh to increase ventilation and plastic overlays (3D Fit Print) to embrace midfoot for snug and secure fit. External heel counter cradles the heel and connects with updated Guide Rails system to reduce rotation and improve stability. Well padded and extremely comfortable interior and collar lining remind its counterpart for neutral runners Glycerin 15. Midsole configuration in Transcend 5 has been slightly affected by updated stability system "Guide Rails" which is responsible to support pronation control instead of other popular solutions like internal medial post. Abundant and soft cushioning is possible thanks to Super DNA™ foam, a typical approach from Brooks used among premium running shoes. Outsole configuration has received minor changes adding more grooves in forefoot to increase flexibility while still using IDEAL Pressure Zones to disperse impact away featuring smooth and uniform transition.